The whale shark is reducing himself.. The sharks, above all after the diffusion of films that have given a distorted image of their behaviors, have been considered as murderous raiders, in the continuous search of food, activity that would bring them to feed of anything they see behind, without distinction.. Reality is very different; these elegant cartilagineous fishes are only great raiders, inserted to the vertexes of the food chain of the environment in which they live and as such they have some notable offensive potentialities. Every kind of shark uses to feed itsels of determine preys, which are outcast with techniques that nothing leave to the case or to the fatality and the search of food, as in every living organism, spends important times within the life of these animals. It is not plundered everything the shark see, but in the 99% of the known kinds there is a real discrimination, based on instincts and preferences. The man in fact, not doing part of aquatic fauna and probably because of the little adipose fabric present in his bodily structure, doesn't reenter in the preys of any shark! Only some kinds that reach great dimensions can represent a danger for the man, as all the great raiders that live on the earth. (The 50% of the sharks doesn't overcome the meter of length, the 82% doesn't overcome the 2 meters, and only 4% reach superior dimensions to the 4 meters, such to represent a serious danger). Every year, in all the seas of the globe, there are about 60 attacks, about 0-6 deadly. In almost all these cases the death is caused by the gravity of the first and only bite that the shark uses, together with the other senses, to become account of that that is found in front, because it really uses to select its preys and to discriminate what doesn't reenter in its diet. The shark in fact usually doesn't continue the attack and it doesn't swallow the prey but it gets further.. There are very dangerous situations that can attract the sharks and to increase the risk of an attack, as during a food frenzy, in presence of issue of sounds to low frequency or with blood and other bodily liquids in water. Also the outline of a surfer that swims with the hands toward the outside above its table can be exchanged for that a sea mammal, prey aspired by the great sharks.. Some attacks are known to underwater fishermen that swam in waters where great quantity of blood had been poured because of their fishing and where the dying preys were fixed dangerously to the belt..
All these considerations, united to the datum of fact what the man capture and kill every year around 100 million sharks, to feed the food and commercial market, can let us think that currently the shark is transformed by great raider to.. great prey. Many aspects of the sharks biology and ethology are not very well known, above all because of the difficulty to study these fishes in their natural environment and for their bashful and solitary behavior Here you can read many informations about their evolution, biology and morphology. The most ancient fossils of these animals go up to around 400 million years, and the biologist thinks that their evolution has even already arrived at the most level 100 million years ago. The skeleton of the sharks is not bony, as that of the common fishes but cartilaginous, formed by cartilage, similar to that that constitutes the ear or the human trachea. Contrarily of the common fishes, the sharks don't possess the swimming bladder (an inside afloat body that can fill him with gas) whose function of support to the floating is replaced partly from the big liver, that can reach the 25% of the animal weight. Sharks are predators and in their diet it can be present fish, smaller shark, shellfish, mollusc and sea mammal. The biologist knows three kinds of sharks that eat plankton, filtering the water that enters from their jaws. They are the already quoted Whale Shark (Rhincodon typus, up to 18 ms.) Elephant Shark (Cetorhinus maximus, up to 13 ms.) and the Great mouth Shark (Megachasma pelagios, up to 5 ms.). Sharks form is generally tapered and hydrodynamic, with the lengthened face and pointed, to favor the advancement in water. Sight: the sight of the sharks, contrarily to the popular thought, is very developed. The pupil can tighten or to widen in base to the light quantity, and in many sharks it is present, behind the retina, the tapetum lucidum, a series of reflecting plates that amplify the light andallow the sight also during the night. Under conditions of strong illumination the tapetum lucidum is darkened, not to dazzle the retina and to also provoke irreversible damages. Ampullae Lorenzinii: they are of the organs that take contact with the outside through small and numerous holes, present especially in the region of the head, full of a gelatinous conductor substance, in communication with nervous terminations. 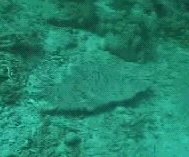 In this way the shark has the ability to perceive the electric fields produced by the animals (therefore individualize preys under the sand) and probably to recognize their position in comparison to the magnetic earth fiels. Sharks body is covered with placoid scales, also called like small teeth. They have the same structure of those of greater dimensions, that are found in the jaws. The placoid scales, besides constituting an effectiveness protection of the shark body, reduces also the resistance to the sea water, improving animal capacity to swin. The teeth that are found in the superior and inferior jaws are modified placoid scales and they are very great. Their form and disposition point out of what preys the sharks are usual to feed in fact long and sharp teeth as those of the bull shark (Carcharias taurus) are proper to pierce and to hold back small fishes and cefalopods, while those more breadths and pieces as those of the shark tiger (Galeocerdo cuvier) develop a greater resistance and they serve for shattering hulls and to shear pieces of food. In the sharks jaws the teeth are prepared in more file, six and the last toward the inside of the mouth are generally tilted, covered by a fold of fabric and not yet completely developed. 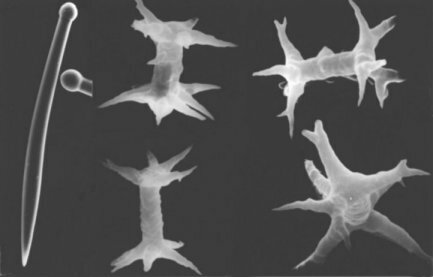 During the growth the tooth is subject to a move in ahead for the continuous formation of the gengival fabric to which is connected. In their advancement they progressively straighten, because of the simple mechanical tension, until they don't become entirely functional. After a few times the teeth of the anterior lines are destined to fall, following traumatic breakups or spontaneously and the biologist think they are singly replaced every 8-15 days, more frequently in the youngest samples. The biologist think that some kinds of sharks renew a whole line of teeth to the time. The day December 23 year 2004, in the north of the Macquarie Islands (near Australia) it happen one of the strongest earthquakes that can be remembered in the history of that angle of the planet. The magnitudo is 8,5 of the Richter scale, a very high value and in the following hours there are many arrangement shakes. The Geology teaches that generally a strong earthquake doesn't cause others of it and also for this motive nobody could imagine that later as soon as three days there would be recorded, to around 3000km of distance, the most violent earthquake of the last 40 years..
On December 26 in fact it happen an earthquake with epicentre in northwestern of the island of Sumatra, in the backdrops of the Indian ocean, it frees an energy equal to that that would be had with the explosion of 20000 atomic bombs.. This event causes the move of the Earth of 3 cm in comparison to its axle of rotation, a shortening of the day of 3 second milionesimis, a move of the island of Sumatra of 30 mt toward southwest and above all one of the more powerful tsunami ever observed to man memory.. The tsunami, from the Japanese “wave of the port”, can be caused, as in this situation, from a strong submarine earthquake that upsets and it moves upward very violently the column of impending water from the lower part. This move produces a series of so that anomalous waves that can spread for thousand kilometres with very high speed, up to reach the dry land. In opened sea the waves have a least height, as soon as 50 cm or less, but when they reach lower backdrops the masses of water, because of the attrition, decrease the speed of their run and they also raise him up to 10 meters, as on December 26 happened, flooding the dry land..
Before the waves get depressed on the coast there is a strong backwash, the sea withdraws it for about ten meters and this is the signal that water is about to invade the dry land. 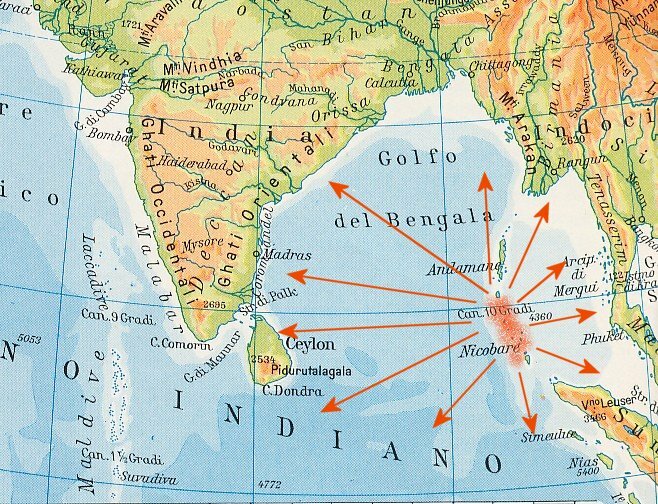 The areas struck by the tsunami of December 26 have been Thailand, India, the Sri Lanka, Indonesia, the Malesia, the Maldives and the waves have also arrived in Africa, on the coasts of Somalia, Kenya and Tanzania. All the coral formations of these zones, the richest of the globe as biodiversity (with around 1700 different kinds of fishes and 400 of madrepore) have harshly been stricken from the destroying strength of the waves and on them there are poured great quantities of mud, sand and refusals. The waves of return that have invaded the dry land have in fact dragged in water deposits, refusals, poisons and hydrocarbons torn from the industries and from the man residences. 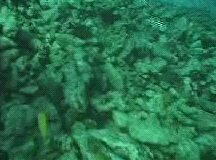 They are still few, to two months from the event, the underwater surveys effected to know the state of the flora and fauna, but they immediately result evident the great quantities of sand that have covered the coral reefs.. This coverage can put to risk the survival of the same coral, in fact it doesn't allow the algas zooxantelle that live inside of it to receive the light of the sun and to effect the chlorophyllose photosynthesis. If this situation persisted different months the algas they would risk to die, putting also in serious difficulty the coral that he/she lives in symbiosis with them, receiving important organic substances for the development and for the construction of the barrier. A solution could be that to organize a plan of “cleaning” of the corals that involves numerous and willing scuba divers making to literally return to the light these wonder of the nature. We hope that the strong tides that are present in a lot of of these zones can naturally polish up the barrier and to contribute to the return of a situation of normalcy. The strength of the waves has caused besides the breakup of many branched corals, landslides of portions of reef (even stop of 1-2 ms cubes eradicated by the walls) with the accumulation of them on the backdrops, inclusive those of the passes, that have decreased their depth of 2-3 meters in some zones! (the passes are of the small interruptions of the coral barrier that connect the ocean with the inside sea to the atoll, through which strong tides generally flow). The numerous destroyed areas could have left besides the abundant tropical fauna of which this area is rich without shelter, as for example the parrot fish that is usual to use the hollow among the corals as mend for the night. This fish nourishes him of algas that it tears from the barrier with its horny beak and the zones where usual feed could have been destroyed. The lobster as other kinds of shellfishes and tropical molluscs that hide him in the ravines of the madrepores, could be found again without habitat and forced to adapt again and to colonize other zones. The "barracuda", great raider that can reach 2 meters length that it stirs at night in flock during the day and hunting, needs to live in clear waters and the movements caused by the tsunami could now create difficulty. Which zones has been mostly struck by the violence of the tsunami ? 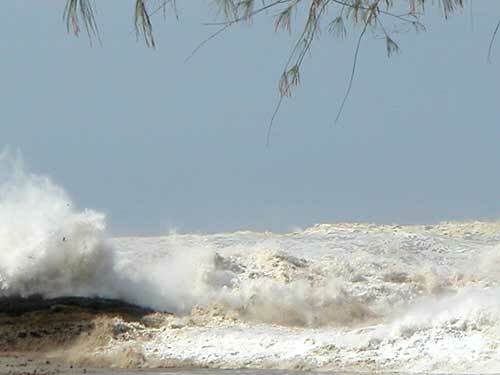 The Asian area and particularly the coral barriers of the islands Andamene and Nicobare have mostly been reached by the violence of the anomalous waves. Here numerous bushes of corals have been observed branched broken, heaps of fragments, deposits in the backdrops and portions of collapsed reef and partially covered of sand.. In the most distant areas, reached by a smaller violence of the waters, the coral barriers seem to have brought damages of smaller entity. To the Maldives for instance, in base to the preliminary study effected by the Marine Science Group of the university in Bologna, the damages would be more contained and they would represent only the 6% of the whole coral system, recoverable in brief times. 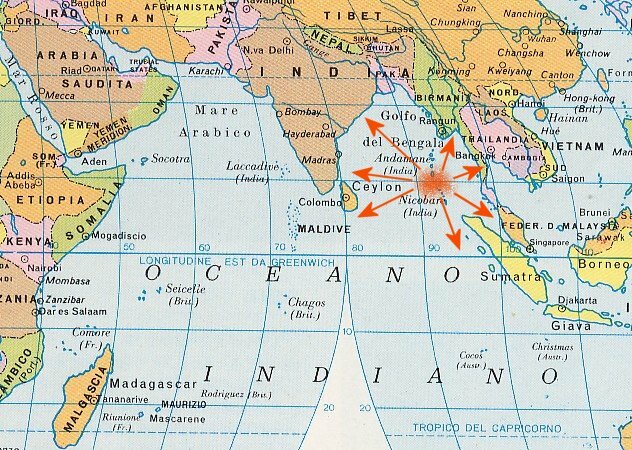 In this case a function of protection of the island of Sri Lanka is hypothesized. The island would have braked the run of the anomalous waves and also the particular conformation of the depths backdrops of the Maldive. These are the effects that the impact of the anomalous waves has directly produced and indirectly on the natural environment of the coral barrier of the Asian area. Which have been the direct effects of the arrival of the tsunami on the sea fauna and earthling instead? The results of the first searches seem amazing. All the animals that had the possibility to get further in hurry would have done it just before the arrival of the anomalous waves reducing their losses to very low levels. As it surely regards the sea fauna some fishes, molluscs and shellfishes of small dimensions will have surely been beaten with deadly result on the barrier but the majority of them will have perceived with good advance the arrival of the masses of water. This thanks to their acute senses, above all the ability to gain tall or low frequencies that would have alerted them with good advance giving them the permission to shelter in sure depht waters. (Obviously the underwater surveys have noticed that in some zones there is no more abundance of fishes but this situation it is probably connected to the alteration of the habitat, with the destruction of shelters and dens in the barriers, referable situation to normalcy in brief times). These “information” about the arrival of so that anomalous situation have also been perceived by the terrestrial animals, making them get further in territories distant from the coasts and to greater heights on the level of the sea. In the Yala National Park of the Sri Lanka in fact, house of hundreds of buffalos, elephants, crocodiles, leopards, monkeys and other numerous mammals there has not been found anybody trace of carcasses even if the tsunami in that territories of the park has arrived with great violence flooding it almost entirely! - “Tsunami Survey Expedition, Maldivian Coral Reefs, 2 weekses after” Marina Science Group. - “The risk tsunami” of L. Bignami. The alarm launched the last 26 December 2004, after the strong tsunami caused by a submarine earthquake of magnitudo 8,5 of Richter staircase in the area of the Asian Southeast, is judged excessive today. The coral reef in fact, present on the planet from more than two million years, seems to have overcome this catastrophic natural event. However also in these sites the coral reef and its inhabitants are "reacting" and in relatively brief times this environment should return to the ancient shines. 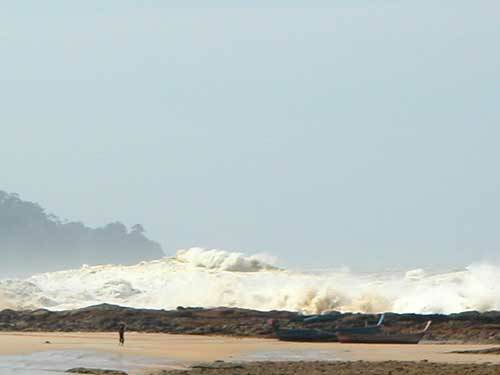 The strong tides, present in many sites influenced by the waves of return of the tsunami, are getting further the refusals, the polluting agents and the sands that has been deposited above the corals, allowing the asimbiotic algas and therefore to the same barrier to survive. Also the tropical fauna would be again populating the reef, doing so to return intact that unbelievable biodiversity of which this environment has always been characterized. The whale shark (Rhincodon typus) is currently the greatest known fish. 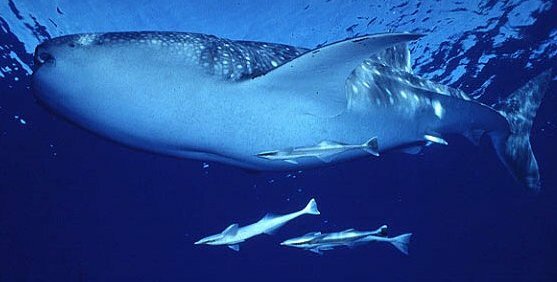 The whale shark swims in all the warm and tropical moderate seas and appears with its characteristic bluish back with strips and roundish stains. The abdomen is white and has mimetic functions, in fact from the lower part upward the white coloration confuses him with the brightness of the sea surface, while from the tall one the bluish back with stains and strips simulates the reverberation of the sun on the water. Despite the dimensions, the whale shark is harmless, he is a fish that feeds him of plankton and small fishes that the shark captures swimming with the open mouth and making the water pass through the filtrator apparatus connected to the gills. Often reveal him curious and almost friendly, letting himself approach and to touch from scuba divers and skin-divers (behaviors very invadent as "rideing" the shark are to avoid becouse they always create trouble and stress to the fish and in some cases unintentional danger situation). An Australian search has made to emerge an alarming situation towards the whale shark. The Australian Institute of Marine Sciences, analyzing the relative statistic data to every animal sighted in the sea reserve of Ningaloo (northwest of Australia), has officially communicated that the middle ransom of the whale shark is reduced by seven to five meters. The whale shark is one of the kinds less studyed and its reproductive cycles are not known but it seems that these fishes reach the sexual maturity after having overcome the length of around seven meters. The cause of the diminution of the middle ransoms would be a heavy activity of fishing towards this great shark, as for other smaller kinds of sharks (100 million sharks fished every year in all the waters of the globe) and for this motive only the smallest and immature samples of whale shark, up to five meters length, continue regularly to be sighted.. The solution, as for other kinds of animals submitted to indiscriminate hunting, could be to turn fishing activity into tourist observation, transporting tourists in a "shark watching" that could save the life to these proud and mysterious inhabitants of the sea and also bring new and meaningful economic resources. In the alone reserve of Ningaloo the "shark watching" would be able in fact to produce a flow of around 60 million of Euro for year! Dimensioni massine: raggiunge i 18 m.
Distribuzione: in tutti i mari temperati caldi e tropicali. Colorazione: dorso bluastro con strisce e macchie rotondeggianti chiare. Ventre bianco. Rapporti con l'uomo: inoffensivo, anche se a causa delle sue dimensioni può danneggiare e rovesciare involontariamente imbarcazioni. Valore commerciale: oggetto di pesca commerciale per la carne, il fegato e le pinne. Denti: 3000-5000 piccoli denti di 3-5 mm. in ogni mandibola. Essendo lo squalo balena filtratore di plancton, la loro funzione è sconosciuta. Note: squalo massiccio, di forma cilindrica con visibili carene lungo tutto il dorso ed i fianchi. Il muso è largo, piatto, con una bocca ampia. La pinna caudale è molto sviluppata. Lo squalo balena si ciba di plancton e piccoli pesci che cattura nuotando con la bocca aperta e facendo passare l'acqua attraverso l'apparato filtratore collegato alle branchie. Considerato una delle specie meno studiate, rappresenta un vero mistero per molti aspetti della sua biologia ed etologia, come la riproduzione, i ritmi di crescita, gli spostamenti migratori e la sua particolare colorazione. Into the sea there are some microscopic organisms, "relatives" to the soft natural sponges (Spongia officinalis) with which our grandparent usually washed, that however have lot of differences.. The excavating sponges are organisms, belonging to the phylum of the Porifera, that have the ability to puncture the carbonatic substrata, mineral and biogenic, present into the sea. The substratum can be constituted, over that from rocky backdrops, also from shells of Molluscs, algas corallinacea and calcareous skeletons of madrepore and corals. The perforation happens through sour secretions that allow the sponge to create a complex net of rooms and galleries inside which the development happens. After having fixed to the calcareous substratum, the larva of sponge begins to dig a series of galleries, of varying dimensions and forms, in the different kinds, very strongly sticking with its fabrics to the calcareous walls. This excavating stadium is called alpha. The body of the sponge is sustained by a whole fibers of "collagene", the "SPONGINA" and from inorganic elements, the "SPICOLES". The calcareous spicoles are the most primitive, while those made of silisium are the most frequent and both the types, with dimensions and characteristic forms for every kind, are fundamental elements for the systematic recognition of the sponges. 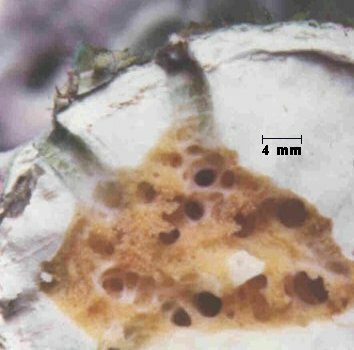 Excavating sponges: Cliona orientalis, galleries into a madrepora, staircase 4 mm. The excavating sponges of some kinds, under favorable conditions, not finding the space anymore to dig new galleries, continue their development to the outside assuming the typical encrusting form. Finally, if the sponge subsequently grows in free final form, come to break up completely the native substratum!! The action of the excavating sponges, whose more important family is that of the "Clionidae", diffused in the Mediterranean sea, represents therefore an important element in the erosion processes and in the production of sediments. In the coral barriers the growth of the madrepores is hindered, producing a weakening of the colonies and an acceleration of the demolitive action of the waves. The shells of the Molluscs result particularly fragile, weaken and they have the tendency to break themselves with serious economic results in the areas where the breeding is practised. To have information about the spicoles, the fabric of the sponge is dissolved in hot nitric acid and what remains is seen through an electronic microscope. In this moment the man can observe another of the innumerable magics of the nature.. Very beautiful forms, elegant, eccentric, a fabulous micro-architecture that remembers that some crystals of snow for shine and unbelievable sense of brittleness. (even if in reality they are not fragile, considering that they result uninjured from the action of the nitric acid). There are a lot the names that have been given to the spicoles of various form and dimensions (the dimensions of the spicoles in image have gone since 5 to the 50 millesimis of mm!). In order of the greatness we can distinguish them in "megasclere" and "microsclere" and here following are described some types. 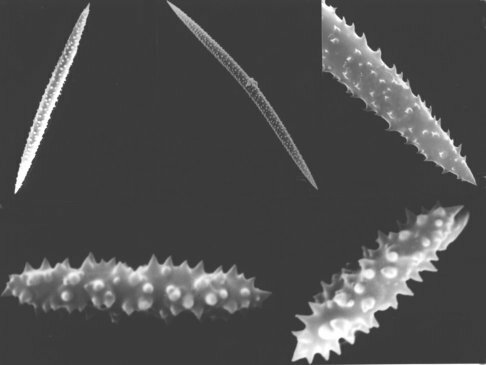 The megascleres can have pointed extremity (oxea), a pointed extremity and one truncates (stylus), a pointed extremity and one bulgy (tilostilo), both the extremities tronche (strongilo), etc... Besides this the spicole can have some thorns (acantoxea, acantostilo, acantostrongilo), to be triraggiate (triassoni) and tetraraggiate (tetrassoni), etc.. The microscleres can have starry form "pluriraggiata" (aster); the rays are born from a more narrow central part (euaster, sferaster) or from an axle more or less folded up (metaster, spiraster), etc.. The Spongia officinalis the "natural sponge" used especially in past in our bathrooms, has an elastic and soft consistence, without spicoles, alone "spongina" and it is for this motive that the contact with the skin doesn't create abrasions or wounds. The excavation of the carbonate from the boring sponges is an important biological trial in the ecology of the sea. In the tropical and subtropical waters the numerous kinds of excavating sponges are among the principal agents (together with bacterias, algas, molluscs, echinoderma, fishes, etc.) in the processes of erosion of calcareous substrata; particularly in the coral barriers the sponges, balancing or at times overcoming the rates of calcification of the corals, develop a key function in the evolutionary processes. The active erosion determines the production of great quantities of end calcareous sediment that will go to constitute the coral carbonatic beaches. 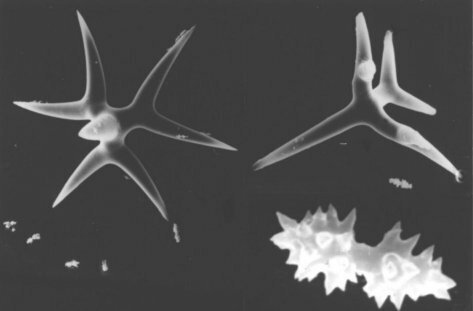 The action of weakening of the coral structures, caused by the rooms and by the galleries of perforation, reflects him in the ecological relationships among the corals of the barriers, modifying them: the most fragile colonies (because of attach) can easily be broken and detached by the atmospheric agents and perhaps replaced by other kinds of coral; the corroded superficial parts can be colonized by numerous organisms. Also in the moderate seas as the Mediterranean the bioerosio of the excavating sponges is important in the rehash and in the evolution of the coast, and it produces meaningful quantity of sediment in the form of fragments to elegant nuisance. The activity of perforation of these kinds can have almost catastrophic effects with remarkable economic lapels in those areas where the breeding is practised (of bivalve, oysters particularly) and the fishing to the red coral. The attached oysters result particularly fragile and they have the tendency to break themselves when they are handled, both during the consumption, and during the phases of the seeding in the breedings of manufacturing oysters of pearls.